Glens Falls is lucky to have The Hyde Collection - not every small town can boast of its local museum and the priceless collection within, not to mention the creative and incredible exhibitions that yearly bring works and artists of big museum quality to the Hyde's cozy interior. "Andrew Wyeth: An American Legend" is one of these exhibits. Though Wyeth himself has recently passed away in January of 2009, it is evident that the wonder and mystery in his artwork, through sheer inertia, will carry on his name into the future. The exhibition includes forty-six works, including watercolors, drybrush, tempera works, and models. The focus of each selection is to reveal as much about the artist as possible, including his interest in vernacular architecture (dwellings built specifically to local needs), Regionalist traditions (an early 20th century movement from showing city life to displaying rural scenes), and Magic Realism (a blend of magical elements into a realistic setting). The Hyde is also incredibly lucky to have an authentic, intimate touch from Victoria Wyeth, who will visit as a guest speaker on July 12th. The granddaugter of the artist will combine her knowledge as one of the leading experts on Wyeth's work with her own personal experience growing up in her family of artists. Victoria Wyeth's experience would not be unlike her grandfather's, whose son and sister were also artists. He himself was born the son of an illustrator of good renown. Wyeth was known for keeping his subject matter almost exclusively to two places - Brandywine Valley in Pennsylvania, and the area around his summer home in Maine. 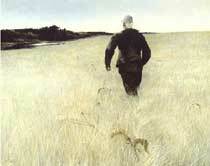 Throughout his life, Wyeth's works were far from unappreciated. He was the recipient of much appreciation, from official awards to public admiration (an exhibit of Wyeth's work that opened in New York City set a new attendance record for the facility). He was elected to the French Académie des Beaux-Arts, the first artist to receive the Congressional Gold Medal, and the only living artist elected into the British Royal Academy. "Andrew Wyeth: An American Legend" opened on June 12 and will reside in the Hyde until September 5. Admission to The Hyde Collection is $10 for adults, $8 for seniors and students with ID, $5 for members, and free for children under 14. The Hyde is open Tuesday - Saturday from 10am-5pm, and on Sunday from 12-5pm. It is closed Mondays and all national holidays. For hours, exhibition info, and other questions, call (518) 792-1761.